For more than 30 years, Whirlwind has been producing high-quality audio cables with musicians in mind. 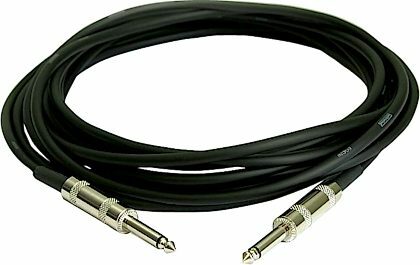 You can benefit from their experience on the stage or in the studio with their standard instrument cable, the GC20. Its 20-foot length is perfect for live settings. You can put some distance between you and your amp without excess coils to trip over. You'll have enough length for your bandmates to cross behind you without getting clothes-lined. The 1/4-inch cable serves many functions in a musician's rig. They typically run from a guitar, bass, or keyboard out to an amplifier or effects unit. As patch cables, they often connect rack processors and powered monitors to the rest of your gear. In the studio, mixer inserts and direct outputs usually have a 1/4" connection. The GC20 is a 1/4" to 1/4" cable specifically engineered for reliable operation in any of these settings. As with all their cables, GC20's are built to Whirlwind's exacting specifications, using only the finest components. The 1/4" connectors have excellent strain-relief to prevent damage no matter how many times you plug and unplug them. Whether your cables stay connected in the studio or you take them out on the road, you'll have years of trouble-free use. No more tedious hours spent looking for a short circuit. On tour, instrument cables come out of the van, get uncoiled for the show, then wrapped up again for the trip to the next venue. They get stepped on, tucked under amp-handles, and tripped-over. All this wear can take its toll, leading to cracks, shorts, and ultimately, poor sound quality. Whirlwind uses a finely stranded 20-gauge wire for the GC20's center core, and a strong, supple outer-shield to guard against scuffs and pinches. Your cables will have the toughness and flexibility to stand up to heavy road abuse, no matter how long you're on tour. No one wants to hunt for a music store 20 minutes before the gig, so make sure your cables are reliable and ready to rock when you are. Get Whirlwind quality in an economical package! This flexible, low-noise cable is a great deal. Features include high quality connectors. "1 of the best cables out there "Especially for the Price."" Sound: The sound is pretty damn good especially for the price Feature: It's just the cable but its good especially for the price Ease of Use: Plug it and go and its easy to use especially for the price Quality: Seems pretty durable especially for the price Value: Awesome deal especially for the price Manufacturer Support: No support especially for the price The Wow Factor: It seems well built especially for the price Overall: When this 1 gives out I'll buy another 1 from you guys. 26 of 33 people (78.79%) found this review helpful. Did you? 34 of 51 people (66.67%) found this review helpful. Did you?